UNITED NATIONS, June 15, updated post-veto below -- Amid dark talk of a Russian veto threat, Monday in the Security Council the UN's Observer Mission in Georgia (UNOMIG) faces cancellation or at most a mere two week reprieve, Western Council diplomats tell Inner City Press. Georgian diplomats, who are not on the Security Council but pace the hallways outside, seemed resigned that any resolution containing a reference to their country's territorial integrity and continued claim over Abkhazia and South Ossetia would be vetoed by Russia. On June 12, Inner City Press asked French Ambassador Jean-Maurice Ripert about the status of negotiations about the Georgia Mission, given French president Sarkozy's loud diplomacy last August to ostensibly solve the problem. We are working on it, Ripert said. The German mission said work would continue over the weekend. But on Monday, Western Council diplomats told the Press that they might not be able to get even a two week roll over. "Russia is playing hard ball," one said. The Georgian diplomat nodded wanly. Russia's position is that its recognition of the unilateral declaration of independence by South Ossetia and Abkhazia rendered moot much of the so-called Sarkozy agreements. Now, many predict that South Ossetia will simply be incorporated into Russia. Abkhazia, on the other hand, seems to be aiming for more independence, putting out a call for its diaspora in Turkey and elsewhere to return and "build the nation." Speaking of nations and wanna-be nations, it is hard not to notice that Russia, which supported Sri Lanka's position that the Tamil "separatists" in northern Sri Lanka could be attacked along with civilians without any formal Security Council meeting, now enforces the separatist rights of Abkhaz and South Ossetians. Russia's argues is that these people were attacked. And the Tamils weren't? At 10:38 a.m. outside the Council, a Georgia diplomat shook his head and told Inner City Press, "It's either short lived or its dead." Watch this space for updates. 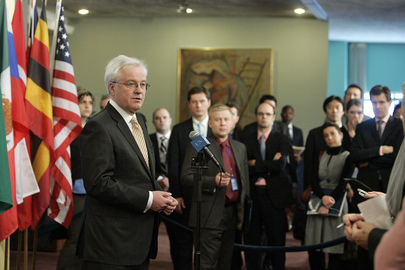 Update of 12:53 p.m. -- Russian Ambassador Vitaly Churkin has made the veto threat public. First he spoke with the Russian press -- "eight minutes straight without taking a breath," one non-Russian speaking reporter described it -- then in English at the stakeout, for UN TV. He said that even on June 12, the "Friends of Georgia" indicated they would look into what to call the mission, for purposes of a rollover. But now, Churkin said, they've put in blue a resolution which includes the name Georgia and pre-conflict Resolution 1808. Russia had said it would vote no, and has counter offered a one month rollover with no reference to Georgia or its territorial integrity. A vote is scheduled for 5 p.m.. They are playing chicken: who will blink first? Update of 5:45 p.m. -- the Council has consulted, now reportedly waiting for China to get instructions. A Western diplomat tells Inner City Press that it could be over by 6 p.m.. By over he means, the end of the mission. Inner City Press asks, what would happened with envoy Verbecke? Back to Lebanon? Or is he... a man without a mission? Watch this space. Update of 6:10 p.m. -- the members are in the Chamber, and Inner City Press in the cheap seats filing this report. Russia's Churkin is speaking before the vote, against "old terms in documents." Veto seems assured. Update of 6:13 p.m. -- Churkin says the Westernerns were "chasing political chimera." A word straight out of Baudelaire, rarely heard these days even at the UN. "Our partners preferred poison to medicine" -- Russia "cannot allow its adoptions." Update of 6:17 p.m. -- Russia votes no, alone. Then four abstentions, including China, Libya and Vietnam. Ten in favor. Not adopted, based on the negative vote of a permanent member. Now Ripert of France is speaking, a counter-telling of the run up to the veto. Update of 6:21 p.m. -- Ripert says there are areas of hatred still remaining, France regrets this Russian veto and expresses its support for Georgia's territorial integrity in its internationally recognized borders. Now Mr. La of China says "we should have made further efforts" with six hours to go. China urges the Group of Friends to arrive at a compromise plan, to show "maximum flexibility." Update of 6:28 p.m. -- Vietnam says it abstained to allow negotiations. The UK's Deputy Permanent Representative says he "regrets' Russia's decision. He says the Abkhaz want the mission to stay, only Russia didn't. Update of 6:32 p.m. -- Japan's Amb. Takasu speaks of humanitarian issues, and "disappointment." There was no reason, he says, to have dropped the reference to Resolution 1808. Croatia follows suit. Uganda calls UN presence "on the ground... vital." Update of 6:40 p.m. -- Costa Rica's Urbina speaks of the "Grupos de Amigos." Mexico's Heller also laments the end of the Mission. Update of 6:47 p.m. -- Libya's Deputy has that any activity on behalf of UN must have the agreement of "all parties of the United Nations." So, my delegation abstained on the vote, he says. Update of 6:49 p.m. -- Burkina Faso says "malgres tout," his delegation calls on all parties to try peaceful response. And now Turkey, the last member after the vote. Turkey co-sponsored the attempted roll over, that Russia vetoed. Update of 6:56 p.m. -- here comes Churkin, using his right of reply. For many years now, we were very patient, in listening to Georgia. Abkhaz representatives were not given an opportunity to tell the Council their position. I could be critical of the statement of the Georgia representative, there is not enough time. But he takes on two or three colleagues. Contrary first the French -- Churkin says all that was at issued today was a draft, on a technical rollover. Then against two unnamed members -- no one mentioned Georgia's aggression, he says. At 7:02, that's it -- to the stake out! Update of 7:50 p.m. -- And after the veto and the abstentions, the doomed resolution's proponents took to the stakeout microphone. Absent, it seemed, was Turkey. Inner City Press asked the UK Deputy Permanent representative for the basis of his statement that the Abkhaz favored the continuation of the mission. He said it was UK sources there. But did they oppose inclusion of a reference to resolution 1808 in the resolution? In the ultimate big resolution, yes they did oppose, was the answer. The implication was that the Abkhaz could have lived with 1808 in the roll-over resolution that Russia vetoed. Inner City Press put the question to Russia's Churkin, who said that Russia is in touch with the Abkhaz, and that it was a shame that the Council never heard from the Abkhaz authorities. As he began speaking, the US' Rosemarie DiCarlo was whispering to some reporters over the stakeout barricade. Churkin indicated that she should be more quiet or move further away. "We are a rules based community," he said. Churkin praised (former?) Abkhazia envoy Johan Verbecke as a good colleague. Inner City Press asked the proponents what happens next with Verbeke. You have to ask the UN, Amb. DiCarlo answered. Finally Georgia's Ambassador came out, saying that "one country" had blocked everything. 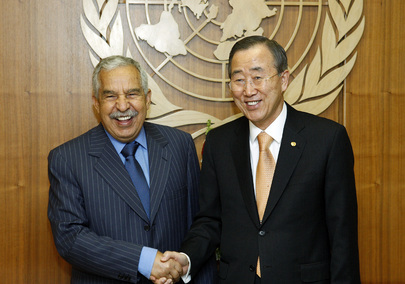 Inner City Press first asked if he stood behind his allegation that Russia blackmailed Ban Ki-moon into changing his report on Abkhazia, to drop the name of Georgia. Yes I do, he said, adding that the day's result showed that Russia couldn't blackmail the whole international community. He again said, one country alone blocked it. Inner City Press asked, what about the abstainers. He replied that each of them had expressed support for territorial integrity. Note that Russia does too, some of the time -- and the proponents didn't, at least when it came to Kosovo. Like we said, selective sovereignty. 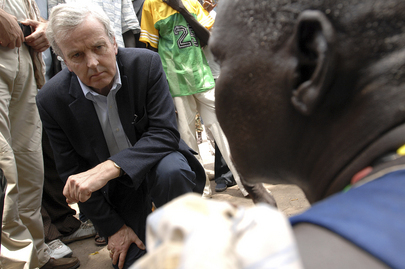 On Sri Lanka, UN's Holmes Contradicts His Colleague's Caution, Sudan Double Standard? UNITED NATIONS, June 11 -- During the bloody conflict and humanitarian crisis in Sri Lanka this year, most often UN Headquarters, personified by humanitarian chief John Holmes, has sounded more cautionary notes about government conduct than has UN staff in Colombo, who face deportation or denial of visa renewals. On Thursday, however, Holmes was decidedly more pro-government than the UN's local spokespeople, at least Mark Cutts, who expressed concern that now people will be kept in the UN-funded internment camps for up to a year. Inner City Press asked Holmes, who chose to disagree. "I don't think anything has changed," Holmes said, repeating the government's statement that 80% of those detained will be allowed out of the camps by the end of 2009. Holmes told Inner City Press that there have for months been some semi-permanent structures in the Manik Farm camps, made of "zinc sheeting, you probably saw them yourself when you were there." Inner City Press did see the zinc structures, along with barbed wire and armed guards. Holmes had been briefing the UN Security Council about the situation in Sudan, with a focus on the international NGOs whose international staff members were ordered out on March 4, after Sudan's president Omar al Bashir was indicted for war crimes by the International Criminal Court. When Holmes came to speak to the Press, his assistant announced that questions should "keep to Sudan, wider issues will be address by the Secretary General in his press conference later." As Inner City Press has reported in recent days, Secretary General Ban Ki-moon's spokespeople now say they will not comment on developments in Sri Lanka such as the deporting of Canadian MP Bob Rae, the extension of state of emergency anti-terror laws, and the country's outgoing chief justice's statement that those in the UN-funded internment camps have no protection from Sri Lanka's courts. That's a national issue, was the answer of Ban's spokespeople. Since Holmes focused, to the Council and press, on NGOs in Sudan, Inner City Press asked about the recent expulsion or exclusion from Sri Lanka of international staff from the Norwegian Refugee Council, Forut, CARE and Save the Children, among others. Holmes had just mentioned moves to re-admit both CARE and Save the Children (as well as Mercy Corps and "something not really an NGO, called PADCO") to Sudan. "It is hard to make comparisons between the two," Holmes said, apparently referring to restrictions in Sudan and Sri Lanka. "NGOs have not been expelled from Sri Lanka... There have been some visa issues for some members of NGOs' staff which we take up with the government." Holmes said UN agencies "have difficulties from time to time." Among those difficulties was the detention by the government of Sri Lanka of UN staff and their families, something Sudan has not done. Whistleblowers raised the issue to Inner City Press, after which Holmes said the UN had been complaining behind the scenes. In Sudan, the UN complains publicly. In fact, the government of Sri Lanka stated that the UN had not complained about its detained staff until after the issue was raised publicly by the Press in New York. It is hard to make comparisons between the two -- the UN is loud in its criticism of any move against UN staff in Sudan, while it stayed silent as UN staff were held in detention by the government of Sri Lanka. How then to read Holmes' upbeat assessment on Thursday? We will continue to inquire. Footnotes: Regarding Sudan, Inner City Press asked Holmes why UN envoy Chissano has ended his attempt to solve the problem of the Lord's Resistance Army. Holmes said Chissano "will end or has ended" this work because it is "not a very realistic hope" that Kony will sign a peace deal with the Yoweri Museveni government of Uganda. What next? Inner City Press is informed that, in closed door consultations, Western Council members such as Croatia insisted that there is a wider "humanitarian gap" in Sudan than even Holmes would portray. Holmes and the UN apparently feel no such pressure regarding the situation in Sri Lanka, and therefore revert to the path of least resistance, trying to not criticize the government despite what's happening to civilians. Watch this site.